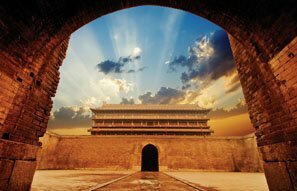 The first landmark visitors will encounter in Xi&apos;an is the ancient city wall, which surrounds the old city in a large square area. The northern side runs parallel to the railway. 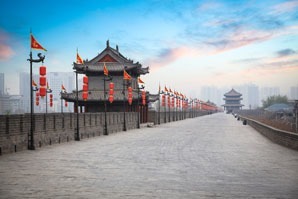 Xi&apos;an was originally a walled city, and even today the wall is considered a landmark dividing the city into the inner part and the outer part. The city wall is massive — tall, long and thick. The South Gate and North Gate are the two main entrances to the inner city. The city itself is neatly arranged along the city wall. 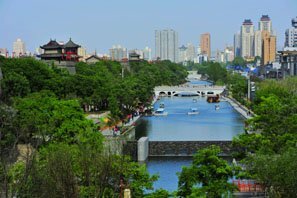 As you leisurely stroll on some of the ancient city wall, you can best enjoy its inner and outer walls, watchtowers, moat, and landscaped environs, as well as slightly elevated views of the city. Having an expert guide will help you appreciate the city wall’s history. It is recommended that you visit in the late afternoon for the best combination of temperature and light for photography. 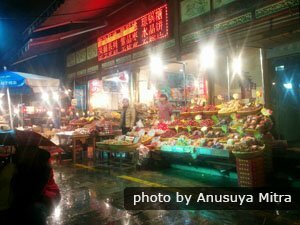 It is also wonderful to stay till evening and enjoy the colorfully-lit wall and Xi’an night views. Cycling on the wall makes for a great way to get some terrific views of the city and a great way to get some exercise (after all that eating at the food street). As the wall is 13+ km (8+ miles) long, cycling is a good way to see more (or all) of it. 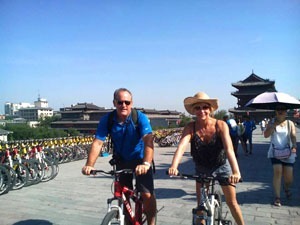 The rental fee for a normal bike (not a tandem) is 40 yuan per bicycle for 1½ hours. We recommend that you rent a bicycle at the foot of the wall for a better price. 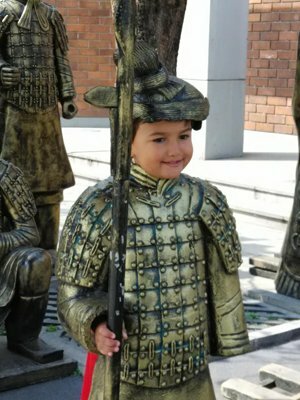 The Xi&apos;an City Wall International Marathon is the only marathon in the world on an ancient city wall (though there is also a Great Wall Marathon). It is a grand event combining history, culture, and marathon running. The event was founded in 1993 and has been held annually since. The 2019 Xi’an City Wall International Marathon will be held on Saturday April 20, starting at 8:30 am at the south gate of Xi&apos;an City Wall. The scale of the event is 5,000 people, including 1,600 marathon runners, a 13.7 km event (one lap of the wall), and a 5 km event. Xi&apos;an City Wall was erected in the 14th century Ming Dynasty, under the regime of Emperor Zhu Yuanzhang. When Zhu Yuanzhang captured Huizhou, long before the establishment of the Ming Dynasty, he was admonished by a hermit named Zhu Sheng, who told him to "build high walls, store abundant provisions and take your time in proclaiming yourself emperor", advice heeded by Zhu Yuanzhang. The current city wall is an enhancement of the old Tang Dynasty structure, as a result of the emperor&apos;s wall building campaign. Interesting to note is that the base of the wall was made of earth, quick lime, and glutinous rice extract, tamped together. It made the wall extremely strong and firm. Later, the wall was totally enclosed with bricks. A moat runs around the walls. A moat, wide and deep, ran around the walls. Over the moat, there was a huge drawbridge, which would cut off access to the city, once lifted. Xi&apos;an&apos;s city wall, after its enlargement in the Ming Dynasty, stands 12 meters high. It is 12–14 meters wide across the top, 15–18 meters thick at bottom, and 13.7 kilometers in length. There is a flanking tower every 120 meters. The flanking towers were built to allow soldiers to see enemies trying to climb the wall. The distance between the flanking towers is within the range of arrows fired from either side. This allowed soldiers to protect the entire wall without exposing themselves to the enemy. There are 98 flanking towers; each has a sentry building on top of it. An artist&apos;s impression of a gate of the Ancient City Wall in its former glory. The gates of the city wall were the only way to go in and out of town. Therefore, these gates were important strategic points, which the feudal rulers racked their brains to try to defend. 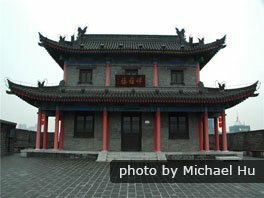 In Xi&apos;an&apos;s case, the north, south, east and west gates, each consist of three towers: the gate tower, which holds the drawbridge, the narrow tower and the main tower. The gate tower stands proud of the wall. It is used to lift and lower the drawbridge. The narrow tower is in the middle. 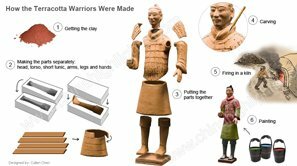 Its inner walls have square windows to shoot arrows from. The main tower is the innermost one, and forms the entrance to the city. The narrow tower and the main tower are connected by tunnels, in which soldiers could be stationed. From the tunnels there are also horse passages leading to the top of the wall. There are gradually ascending steps, made so that it was easy for war horses. There are 11 horse passages around the city. A watchtower is located on each of the four corners of the wall. The one at the southwestern corner is round, probably after the model of the imperial city wall of the Tang Dynasty, but the other three are square-shaped. On top of the watch towers there is a corner rampart, higher and larger than the ordinary ramparts. This shows the strategic importance of the corners of the city wall during wars. Along the outer crest of the city wall there are crenelations or battlements. Under each of the 5,984 crenels there is a square hole, from which arrows were shot and watch was kept. The lower, inner walls are called parapets. They were used to prevent soldiers from falling off the wall, when traveling back and forth. Entry tickets cost 54 yuan per adult. How to get there: Take metro line 2 to Yongningmen Station to reach the South Gate and to Anyuanmen Station to reach the North Gate. There are many buses to get the East and West Gate. China Highlights is the best China-based travel agent that enables you to create your own trip, so you get the best out of any journey, just the way you want it! 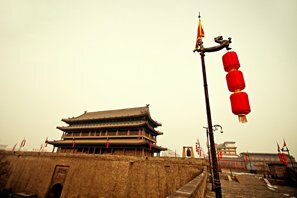 Most of our Xi&apos;an tours include the Ancient City Wall. 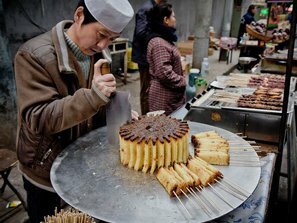 THE GOLDEN TRIANGLE (Beijing, Xi&apos;an, and Shanghai) — Visit China&apos;s classic sights in this 8-day tour — our BEST-SELLER. 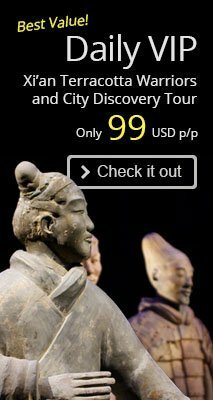 2-Day Xi&apos;an Essence Tour: Visit the best three ancient historical sights in Xi&apos;an — the Terracotta Army, the Ancient City Wall and the Big Goose Pagoda.